Friday, February 3, 2017 - Green Worker Cooperatives, and the Bronx Organizer’s Collective united to host an event to hear from a community leaders on the cutting edge of long term solutions versus the problem facing Bronxites - gentrification of their neighborhood and the displacement of their families and businesses. We see the folks across the city who have limited resources in a desperate fight against the big money of developers. Not to mention the housing policies that favor those developers. Bronxites are searching for tools to stay in their homes and businesses, to have real affordable rents to be near their families, jobs, and more. The good news is there are community led alternatives being used throughout the five boroughs to protect residents. Even as redevelopment and displacement happens around us, the Bronx has a tradition of building shared ownership. Shared ownership is an economic development strategy that organizations can use and are using in their services and campaigns for residents. We know that tools such as community land trusts, and housing &amp; worker cooperatives can provide stability to those most vulnerable. Green Worker Cooperatives believe these are solutions to the problems of a shifting city and we can give our assistance to community groups and individuals to begin the process of growing collective wealth. Here, in the Bronx. 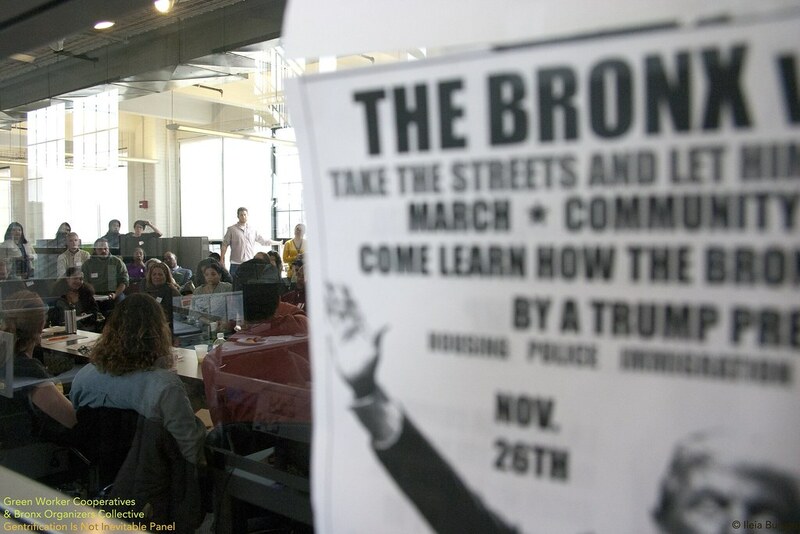 Kendall Jackman, Moderator - is the co-founder of Bronx Organizers Collective. Member of Picture the Homeless, former Housing Campaign Leader at PTH ( Count Coordinator of Vacant Property Count), Founding Member of New York City Community Land Initiative (Steering, Education and Outreach Committees), Core Member of South Bronx Community Food Coalition, Member New Settlement Community Food Action Leadership Group. Omar Freilla is the founder and director of Green Worker Cooperatives. Omar has over 13 years of experience in cooperative & green business development with an equal number of years as an organizer challenging environmental racism, classism, and sexism. Mychal Johnson has a long-standing track record in community-based advocacy for environmental, economic and social justice in the South Bronx. He is a co-founder of South Bronx Unite and a member of the Board of Directors of the Mott Haven-Port Morris Community Land Stewards. He also serves on the Board of Directors of the NYC Community Land Initiative, and several environmental preservation and stewardship boards and groups. He advocates for greater access to green space, truly affordable housing and quality of life enhancing efforts without gentrification in the South Bronx. Marcus Moore is a leader at Picture the Homeless and has actively participated in the New York City Community Land Initiative through Picture the Homeless. Specifically, he has been heavily involved in creating our popular education materials, including Trustville, the board game we created with New Economy Project and Hester Street that educates folks on how people who are currently left out of the market could find housing through land trusts and mutual housing associations. He is also an urban homesteader who deeply understands the need for housing stability. Lauren Wilfong is the Program & Operations Coordinator at New Economy Project, an economic justice advocacy organization based in NYC. Among other things, she represents New Economy Project in the NYC Worker Cooperative Support Network and co-chairs the Education & Outreach working group of the NYC Community Land Initiative. Celeste Hornbach is the Director of New Co-op Development at UHAB.She joined UHAB in 2015 as a project associate in the Co-op Preservation department. In that role she assisted UHAB-developed affordable cooperatives in budget preparation and all other aspects of technical assistance that keep them healthy and well-functioning. She now helps ensure the successful co-op conversion of buildings in UHAB's development pipeline and she continually seeks innovative ways to create resident-controlled affordable housing in New York City.